Lens Cleaning Towelettes And Solutions Are Used For Applications Including Medical, Laboratory, Optical, And More. 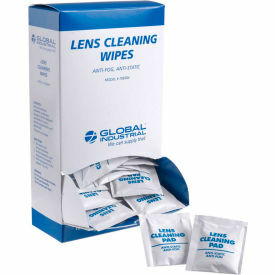 Lens cleaning towelettes and solutions are made of high quality materials for long lasting durability and dependability. Units provide eyewear maintenance for anti-fog and scratch resistant surfaces. Available in pocket-size pre-moistened towlettes or spray bottle. Does not contain silicone. Available styles include 1 Gal Lens Cleaning Solution, 16 Oz Bottle Lens Cleaning Solution, Canister Lens Wipes, Eyewear Cleaning Wipes, Large Disposable Cleaning Station, Large Disposable Lens Cleaning Station, Large Double Lens Cleaning Station, and Lens Cleaning - Spec Saver Towelette. Package quantities range from 1 to 1200/Box. Dimensions vary per model. Lens Cleaning Solutions Are Recommended For Industrial, Medical Or Manufacturing Areas Where Proper Care Of Safety Glasses Is Necessary. Lens Cleaning Solutions are specially formulated to clear streaks, smudges and dirt from glass, plastic and protective lenses. Liquid Solutions, Tissues and Towelettes available for use where needed. 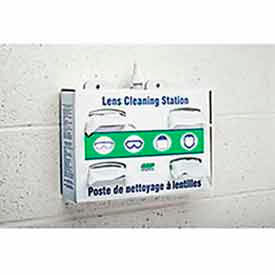 Lens Cleaning Stations keep lens cleaning supplies close at hand. Include solution and tissues. Dimensions vary per model.